(l to r) Preston Creech, Chaplain, Lenny Joiner, Treasurer, Alan Perano, 1st Vice Commander, Ann Dolittle, 2nd Vice Commander, Robert Loar, Commander, JoJo Doolittle, Past Commander, Kenneth Hartkopf, Adjutant. 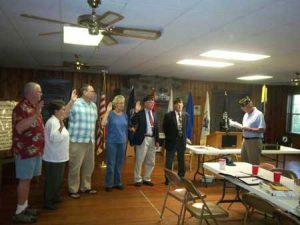 Kenneth Hartkopf, Post Adjutant for American Legion Post 30 officiated as new officers were sworn in. At their monthly meeting on Thursday evening, outgoing Post Commander JoJo Doolittle passed the gavel to Robert Loar. Other new officers were: Preston Creech-Post Chaplain, Lenny Joiner-Treasurer, Alan Perano-First Vice Commander, and Ann Doolittle-Second Vice Commander.